So, you’ve updated Drop Assault and have a new unit at your disposal. 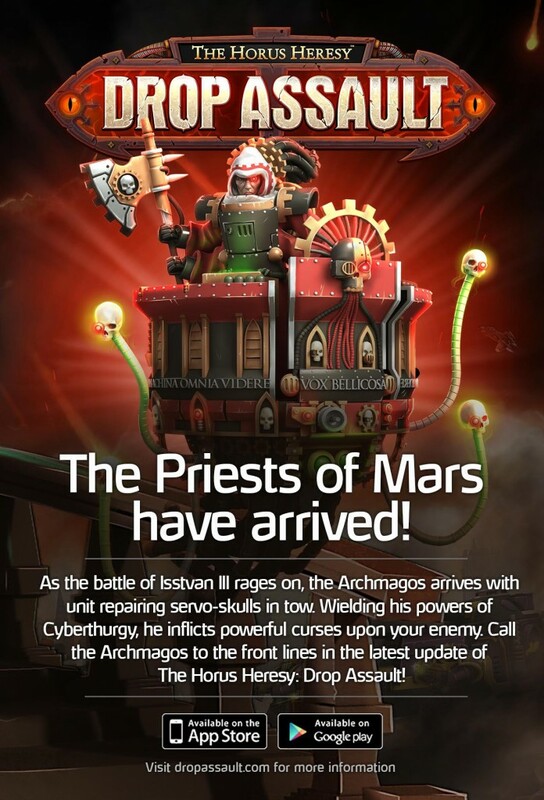 You may be wondering what the Archmagos does or how he can help your team on the battlefields of Isstvan III. Worry not, for we’ll explain. We’ve got a video coming your way shortly showing a number of strategies for the Archmagos, but here’s what you need to know until then. The Archmagos is a dedicated support unit responsible for healing your team and casting curses on your foes to increase overall damage dealt by your accompanying units. He can skim over mines thanks to his hovering Abeyant platform. That doesn’t mean he can’t get caught in one activated by a nearby unit, so be careful! As with all other units, the Archmagos is level 1 when unlocked. The number of Servo Skulls that tag along with him, as well as the amount by which they’ll heal your teammates, will rise as he is leveled up through your Research building. The Archmagos’ mighty curse will also increase in duration with his level. We have a lot more to share with you about the Archmagos in our upcoming video, but until then, we encourage you to check out this new unit for yourself.